Axel: What, did they promote you to captain or something?Billy: I'm DDO-JSIOC.Axel: The jay-jay-jo-jo-see? What is that?Billy: It stands for Deputy Director of Operations for Joint Systems Interdepartmental Operational Command. 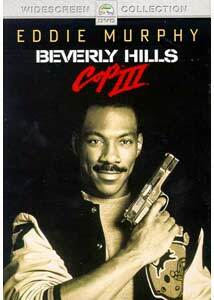 When Eddie Murphy made Beverly Hills Cop, he was on the top of the world. By the time of Beverly Hills Cop III, Murphy had racked up a string of duds that nearly destroyed his career forever. For many people, Beverly Hills Cop III is one of those duds. And while the movie is certainly not as fresh or original as the first film, it's certainly a cut above Murphy's weakest films. For me, and perhaps for others, this film is a guilty pleasure. While I don't often feel the need to watch it, it's still fun while it's playing.Axel Foley (Eddie Murphy) returns to Beverly Hills for a third time, after his boss is shot in a chop shop bust gone horribly wrong. Foley finds connections between the killers and a Southern California theme park called Wonder World. Since Foley is in California, he calls on his LA contact Billy Rosewood (Judge Reinhold) to assist him. Rosewood has gone from an insecure officer to a position of power, so he's now able to give Foley more assistance than he could before. Rosewood introduces Foley to Jon Flint (Hector Elizondo), who knows the head of security at Wonder World, Ellis De Wald (Timothy Carhart). When Foley meets De Wald, he immediately recognizes his boss' killer, but no one will believe him. In his attempts to find out more about De Wald, Foley uncovers a counterfeiting scheme taking place at Wonder World, and is framed for murder.The story won't win any awards for originality, but it does allow director John Landis to poke fun at theme parks, plenty of which are stationed in Los Angeles. Some of the funniest gags take place at Wonder World, where a keen observer can see several jabs at Disneyland, Universal Studios, and Magic Mountain. Much of the hilarity of the previous entries in the series came from the interplay of Murphy and Reinhold. That is lessened with this installment, but Landis makes up for it with a bevy of inside jokes, some genuinely thrilling action sequences, and the return of Bronson Pinchot as Serge, the art dealer from the first film. Pinchot steals the show. Almost every line of his is hilarious, and he provides the best sight gag of all three films: The Annihilator 2000. The Annihilator 2000 is a machine gun, bazooka, microwave, FM/AM radio, and CD player, all packaged together in a nice little bundle. Pinchot stands as the high point of the film, and sometimes I wish there was a Serge spin-off film.The film also has some effective action sequences. The opening scene has a shootout and a car chase combined with a slight use of slapstick, and starts the whole thing off with a bang. The other centerpiece is a dramatic rescue on a theme park ride called The Spider, which has Murphy jumping back and forth from one part of the ride to another while the ride is stuck up in the air. Landis directs the action by showing what is going on. He doesn't resort to camera trickery to make the sequences more exciting. In general, he gives more balance to the film than Tony Scott did with the second installment. Landis also fills the movie with small cameos. See if you can spot George Lucas, Joe Dante, Barbet Schroeder, Julie Strain, Joey Travolta, and plenty of other well-known directors.What really makes the film work are the performances from Murphy, Reinhold, Elizondo, and Carhart. Murphy once again imbues Foley with a street-smart, wisecracking attitude that always gets him into so much trouble. Reinhold has gone from a cop trying to make his way to a cop who has made it. Now he has more power with which to back Foley up, but he also has more to lose if Foley screws up. Elizondo is really fun as Jon Flint, who introduces Foley to De Wald, and has the most to lose if Foley harasses De Wald, because Flint is planning on getting a high paying job from De Wald after retirement. Timothy Carhart is very convincing as De Wald. In fact, as Carhart notes in the bonus materials, people actually remember the name "Ellis De Wald" when they see Carhart on the street. In the end, it's the performances that keep the movie interesting. Image Transfer Review: The transfer for Beverly Hills Cop III is a little dirtier than I thought it would be. There are noticeable specks on the print in several scenes. However, the colors come across cleanly and beautifully. The picture is never too dark, even in the night sequences or on dark rides. Overall I was pleased with the picture, but the dirt that appears from time to time is distracting and conspicuous. Audio Transfer Review: The 5.1 mix of Beverly Hills Cop III is active without becoming gimmicky. For the most part, the rears are used for the score, but every so often a sound effect can be heard emanating from the back. Most of the movie is anchored in the front three speakers, but a wide sound field in which to move is provided. Also provided is a Dolby Surround 2.0 English mix, and a stereo French mix. Extras Review: The disc features a collection of over thirty minutes of interviews that covers the making of Beverly Hills Cop III in fairly good detail. We get the screenwriter, the producer, John Landis, Eddie Murphy, Timothy Carhart, Judge Reinhold, and others. They talk about the film from pre-production to the possibility of Beverly Hills Cop IV. There are a few (very few) shots of behind-the-scenes footage. Considering this isn't a major film, about thirty minutes seems just enough to get all the information you need about the making of it. Also provided is a theatrical trailer. Sure, it's not original. It's not new. But for what it is, Beverly Hills Cop III still delivers action and laughs. While in some ways it's weaker than its predecessors, the film is still more fresh than most third entries in other movie series. If you like the other two Beverly Hills Cop films, there's no reason you shouldn't like this one.